Have Rick and his crew survived the undead horde? Is The Walking Dead TV show cancelled or renewed for a ninth season on AMC? The television vulture is watching all the latest cancellation and renewal news, so this page is the place to track the status of The Walking Dead, season nine. Bookmark it, or subscribe for the latest updates. Remember, the television vulture is watching your shows. Are you? A zombie apocalypse drama series on the AMC cable channel, The Walking Dead stars Andrew Lincoln, Norman Reedus, Lauren Cohan, Chandler Riggs, Danai Gurira, Melissa McBride, Lennie James, Alanna Masterson, Josh McDermitt, Christian Serratos, Jeffrey Dean Morgan, Seth Gilliam, Ross Marquand, Austin Amelio, Tom Payne, Xander Berkeley, Katelyn Nacon, Steven Ogg, and Pollyanna McIntosh. 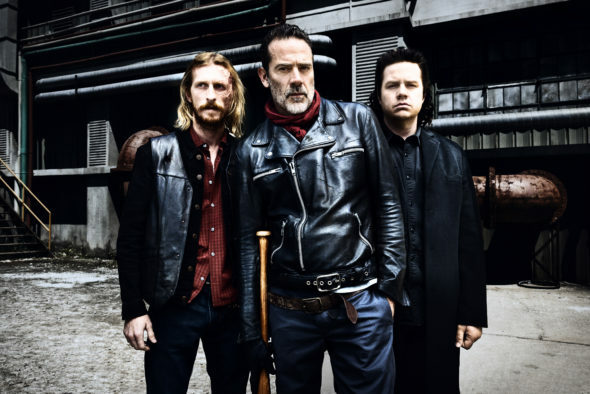 The eighth season kicks off with Rick (Lincoln) and company banding together with the Kingdom and Hilltop, in order to bring the fight to Negan (Morgan) and the Saviors. The eighth season of The Walking Dead averaged a 3.39 rating in the 18-49 demographic and 7.82 million viewers. Compared to season seven, that’s down by 37% and down by 31%, respectively. Learn how The Walking Dead stacks up against other AMC TV shows. On January 13, 2018, The Walking Dead was renewed for a ninth season which will debut October 7, 2018. Stay tuned for further updates. Unless the unthinkable happens, since it has been AMC’s top-rated TV series, it is hard to imagine the network will cancel The Walking Dead. Still, all good things must come to an end, so I’ll keep an eye on the Nielsen ratings and update this page with breaking developments. Subscribe for free updates on The Walking Dead cancellation or renewal news. 1/13/18 update: AMC has renewed The Walking Dead for season nine and named a new showrunner. Details here. TV show ratings are still important. Follow The Walking Dead‘s weekly ups and downs. Find more The Walking Dead TV series news or other AMC TV show news. What do you think? Are you glad that AMC has renewed The Walking Dead TV show for a ninth season? How would you feel if they had cancelled this TV series, instead? The Walking Dead: Could There Be a Movie Someday? Oh gosh…and here I thought it was finally over. There is no business keeping this show alive with most of the important cast gone. I won’t be watching. Season 9 should end the walking dead, bring Morgan to fear, have the whisperers show up in fear as well and let it run out a few more seasons and then let it die. It’s had a great run and it still holds up today as far as entertainment goes. Morgan is already going to Fear the Walking Dead but I don’t really like that show. If they keep going like this, there won’t be any characters left on the show. Yes why not , as long as they get rid of Negan this season . I couldn’t bear to hear any more of his boring monologues . Yes it should be renewed. However, the Alexandria storyline ends at the end of the season. Whomever the show runner wants to keep in the show need to get back on the road at the end of the season. Basically 2 areas in 8 years is TOO MUCH!